Experience a spirit of adventure on the Riverboat CITY OF NEW ORLEANS as it takes you on a journey down the mighty Mississippi. See captivating views of the French Quarter fade into the distance as the soulful tune of New Orleans jazz carries you to the pulse of the river. Dine on a selection of quintessential New Orleans dishes while libations flow. Located in the heart of the French Quarter near Jackson Square, below the Steamboat NATCHEZ. Make your way past fern filled cast iron balconies, on your way to the Toulouse Street wharf, as the sounds of her calliope steam whistle echo through the historic French Quarter, drawing you to her as it did 100 years ago. Meet outside the Lighthouse Ticket Office before boarding the newest vessel to the French Quarter riverfront, the Riverboat CITY OF NEW ORLEANS. Revel in classic elegance with a modern twist on an historic paddle wheeler, where New Orleans jazz is your soundtrack and traditional Louisiana cuisine is your main course. Listen to the Captain’s tales of those who have sailed the Mississippi before you, as you wind the infamous curve that gave the Crescent City its nickname. 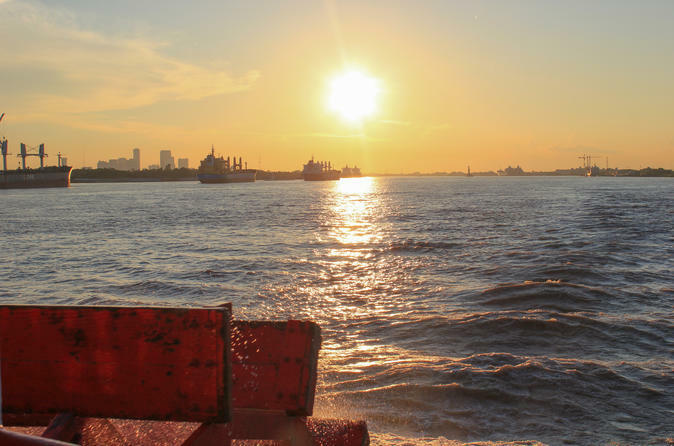 From the decks, view sites such as the battlegrounds of the historic Battle of New Orleans all the while barges and other vessels navigate the fourth largest river in the world, in seventh largest port in the country. Make your way into our elegant dining room to be seated at your reserved table. Order a Mardi Gras themed cocktail to get you into the spirit of a festive evening that is just beginning. Indulge your taste buds on Louisiana classics, such as traditional New Orleans gumbo, from our buffet. Return back to the Toulouse Street departure point as New Orleans night life begins.